It'll be like 'Underworld,' but with rats! 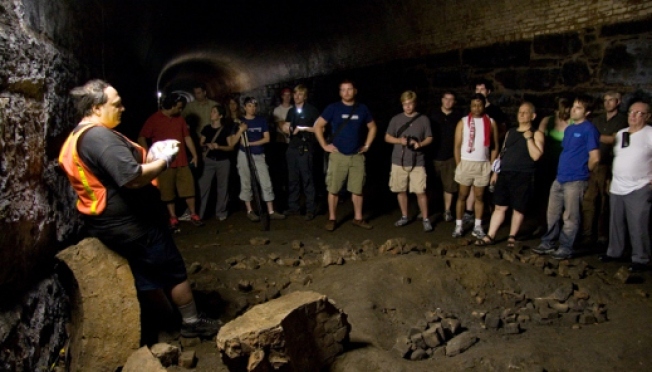 This Sunday, join urban explorer Bob Diamond for an underground tour of a long-forgotten tunnel, located 30 feet below Brooklyn's Atlantic Avenue. Diamond, the president of the Brooklyn Historic Railway Association (BHRA) led a similar tour on Jan. 4th, which attracted about 170 people. Despite the cold weather above ground, the tunnel is said to remain a cool 65 degrees year round. According to YourNabe and the BHRA, the tunnel was built "using only hand tools and primitive (by today's standards) equipment," in 1844 as "a route between New York Harbor and Boston," but, "was sealed up and abandoned in 1861." Diamond hopes to unearth an old steam locomotive that he believes was left down there, buried somewhere behind the tunnel walls. To join the tour, visit BrooklynRail.net to reserve your spot on January 25th.